Send us your song on CD. We are constantly seeking new, undiscoved, talented performers and songwriters to work with our growing organization. Let Us Help You Say It With A Song! Do you write songs? Do you sing or play an instrument? Do you know a talented friend just waiting to be discovered? Send them to us! 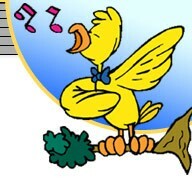 We love discovering new talent at TweetyTunes.com. Send us your song on a CD along with a short bio of yourself or your band. Send us a lyrical sample and let us take a look. You could become our next featured artist and begin making your way to the top of the music industry by getting your first real break with us. We help up and coming artists by featuring their talents comercially. and what you are trying to accomplish with your music. Do you sing for fun? Is music your passion? Are you looking to get a record deal one day? Send us your BEST song. We are always looking for new artists, so you might get a job working for TweetyTunes.com. Each month we will be picking a song sent to us from you to feature here. Send us your song and maybe we can help jump-start your career!